Do you have an Android phone? Are you getting spam calls on a daily basis? Meet CallApp, a Caller ID & Block app that can identify unknown calls from all around the world. CallApp has one the largest database of numbers, which give the app the option to recognize who is trying to reach you! You’ll always know who’s calling you – spam calls, private calls, telemarketing calls and much more, so you can easily decide if you want to answer, or block calls. Smart search – Find all the relevant business and people near your area. Social dialer – Sync and update your contact list with photos & info from social media networks such as Facebook, LinkedIn, Instagram, Google Plus, Twitter & more. Chat / Messaging ID – Identify and block unknown senders from IM social media chat apps such as Whatsapp, Viber etc. Phone Number search – Search for any name or number with our smart search system and dial your favorite friends using our dialer. Social Contacts – Update your contacts with photos & info from Facebook, LinkedIn, Google Plus, Instagram, Twitter & more. 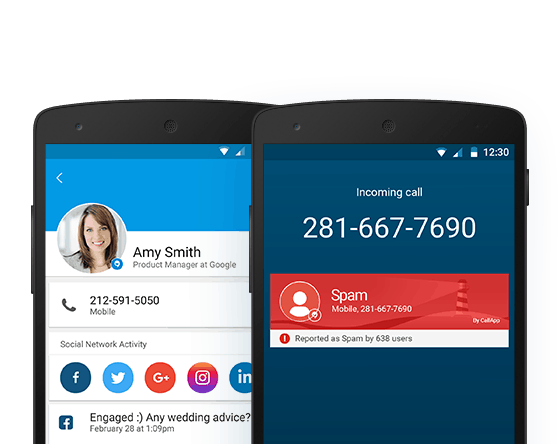 CallApp is an “all in one” solution for your Android phone, it can change your current dialer and contacts book to a better one. Take control over your mobile phone and always know who’s that person behind any phone call.